This is a very early manuscript image of the New Jerusalem. It is from the Trier Apocalypse, one of the oldest extant examples of an apocalypse (Revelation) manuscript, produced in northern France in the early ninth century CE. Apocalypse manuscripts were copies of the text of Revelation, produced with integrated commentary extracts and sumptuous coloured images; they sometimes also included a ‘Life of St John’ or of other saints. They were produced for devotional use in monasteries and convents and for wealthy private patrons, often royalty. In this image from the Trier Apocalypse, we see the first of three images of the New Jerusalem. In this first scene, John is being shown the New Jerusalem by an angel. 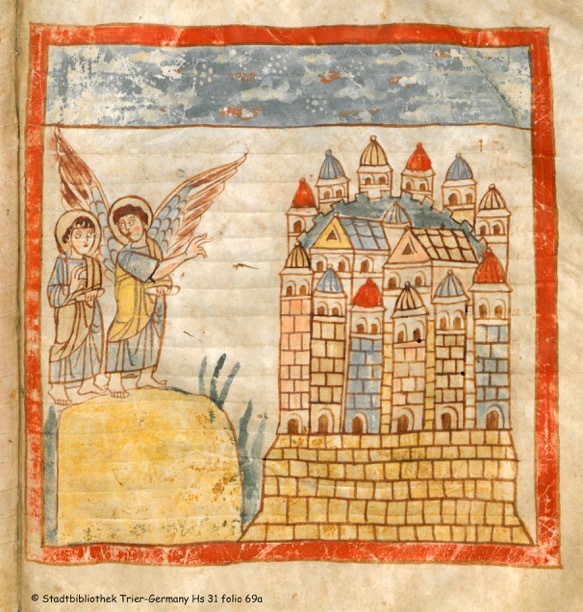 The following two images follow the typical medieval New Jerusalem schema, depicting John being instructed to measure the New Jerusalem by the angel (as in the Bamberg Apocalypse) and the Tree of Life (visible in the Silos Apocalypse). This image is notable for its spare evocation of the New Jerusalem, as well as its adherence to the detail of the text. As specified in Revelation 21:10, the angel has taken John to a mountain to view the celestial city as it descends and, in accord with Revelation 21:12, the artist has faithfully rendered the twelve gates of the city.